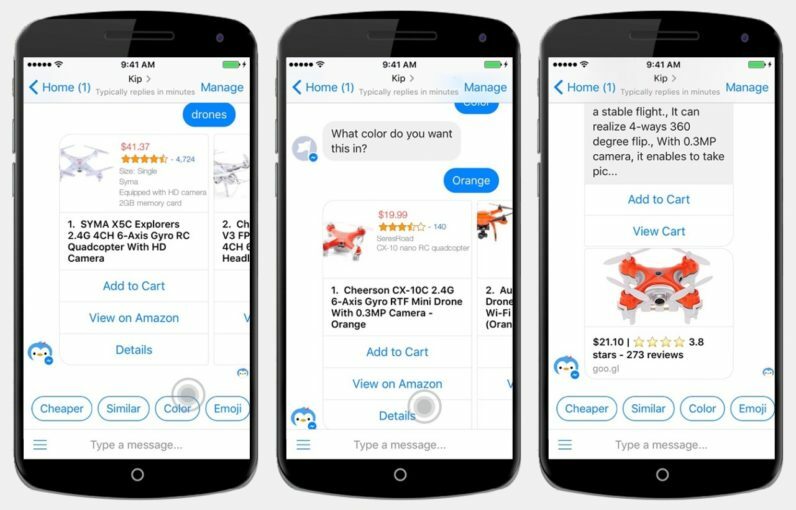 Shopping via bots is nothing new, but Kip wants to make it as easy as entering a few emoji. The problem is, emojis aren’t very specific, and bots are pretty dumb. To start, Kip (already available for Slack) asks a few questions to try and get to know you better, but it’s not clear how my staying in a nice hotel and visiting a grocery store when I arrive in a new town is really personalization. Kip feeds results from Amazon, and it gets a bit dicey. Even something as simple as the coffee emoji can be misleading to a bot. Do I want the “highest quality” whole-bean, or Folgers? Kip doesn’t understand every emoji, or what you might be looking for right away, but does a good job of returning results for the basic ones. The ‘paper clip’ emoji resulted in — well, paper clips. Chicken and noodles? You might want ramen. The team behind Kip say the Messenger bot can also distill results, with options like ‘color’ or ‘price’ after your emoji input. The upside is that Kip learns over time. The more you use it, the better the results will be. Like any bot, Kip needs you interaction before it becomes eerily intuitive. To get started using Kip, just type ‘Kip’ into the Messenger search field or click here.